Stomp yourself out to freedom and enlightenment"
The Sword is the tool, the Form is the skill, and the Practice is the Process to Growth. 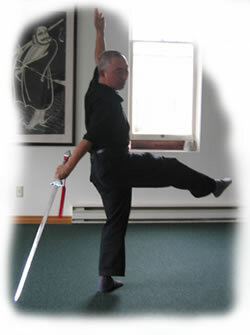 This Sword Form is unique to Master Wu Tu Nan's teachings (It is not the Yang Style Tai Chi Sword Form or the Wu Style Tai Chi Sword Form). He composed this Sword Form during the 1930's to boost up the national spirit of the Chinese at that time. The Form consists of 128 movements and is divided into 3 segments. Students will learn the segments in slow pace to begin with. When they are proficient and confident with their alignments and breathing, they may practise the Form according to their own mood , temperament and rhythm.